DRIP, DRIP, DRIP, WHERE’S THE AGUA? I’m Dripping, So Why Am I Watering? Up to a couple of weeks ago, little water had dropped from the sky this spring here in the Hudson Valley. But a drip irrigation system automatically waters many of my plants. So why have I been spending so much time with hose in hand? Not all my plants drink in the drips. Trees and shrubs are on their own except their first year in the ground when I religiously hand water them every few days initially, and then once a week throughout the season. These plants get 3/4 gallon per week for every square foot spread (estimated) of their root systems. That’s equivalent to an inch of rainfall which, if it does fall, exempts me from a few days of watering. A couple of inches depth of hay, leaf, or wood chip mulch around the trees and shrubs seals in moisture to make best use of my efforts. Also, I start with smaller plants — less than 4 feet tall — which become independent of my watering sooner because a larger proportion of their roots are soon foraging around in surrounding soil that those of larger plants. My flower beds also don’t get dripped. Although the soil surface is dry, moisture carried over from winter still sits in lower depths, into which established perennial flowers’ roots can tap. Annuals and newly planted perennials need to be watered on the same schedule as young trees until their roots reach that moisture. It is my garden vegetables that drink in the benefits of my drip system. But even here some hand watering is needed these days. Down each bed runs 1 or 2 drip lines, with emitters along the lines spaced 6 inches apart. As water enters the soil, capillary pull from small spaces between the soil particles draws water sideways and, along with gravity, downward. The resulting wetting fronts have the shape, if you could look at a cross-section of the soil, of an ice cream cone. In clay soils, with small particles and, hence, a lot of capillary draw, that ice cream cone is very fat; in sandy soils, it’s narrow, a couple of feet wide at its broadest as compared with the 6 foot spread in a clay soil. The wetting fronts start their sideways spread below the soil surface, deeper in sandy soils, more shallow in clay soils. In either case, the soil surface remains dry except right at the point of drip. So any vegetable transplants or seeds I set in the ground need to be hand watered until their roots reach the wetting front — except for seeds or transplants set right under or along the drip line. 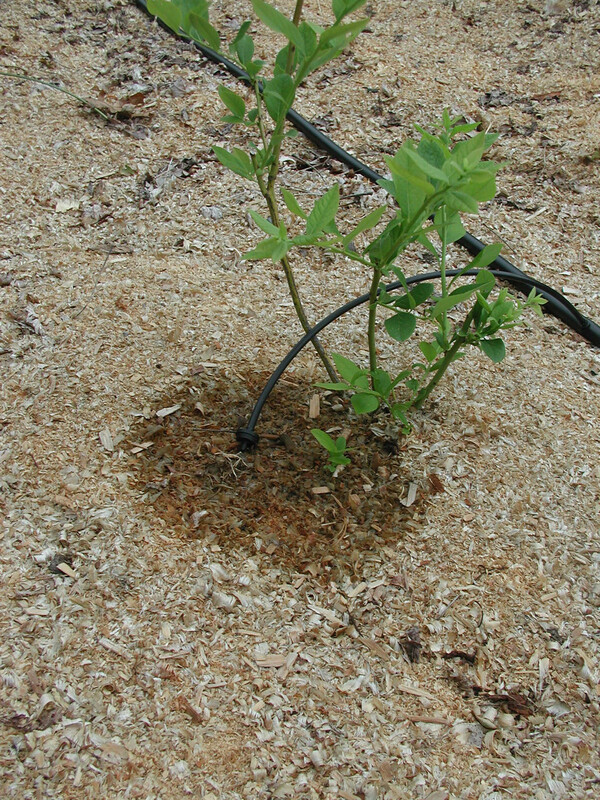 Drip Irrigation Workshop June 20th; see “Workshops“, at this site, for more information. So I asked David how much he watered, and he said he thoroughly soaked the ground by spraying it with water. Busted! It really was a water problem, too little in this case. In fact, thoroughly wetting the soil with the usual 4-foot-diameter, hand held spray is almost impossible. “Thoroughly wet” means soaking the ground to at least a 6-inch depth. 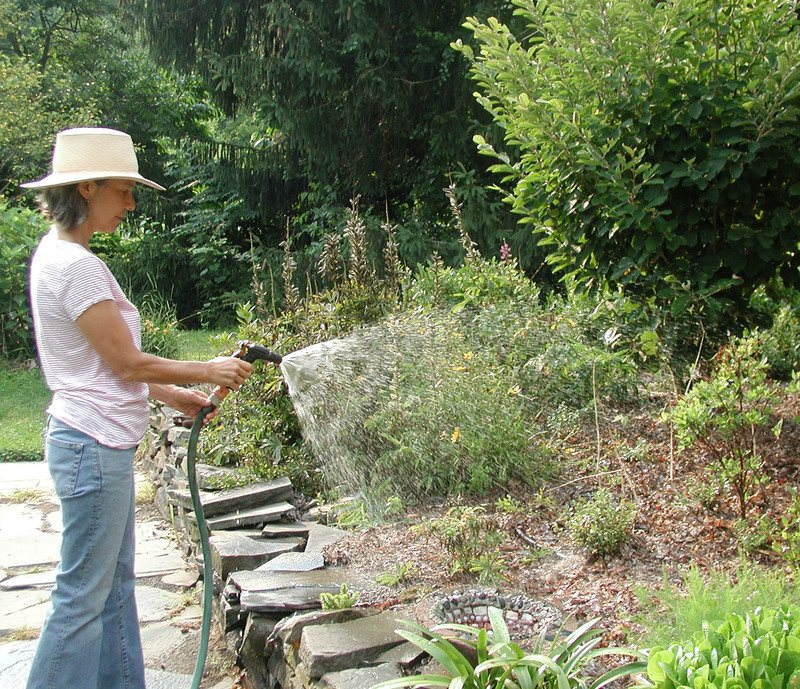 For his hand held sprayer to do that, David would have to stand in place like a statue, sprayer in hand, unmoving, for about an hour to wet one 4-foot-diameter part of the garden before moving on to the next 4-foot-diameter area. When I’m watering plants in the ground by hand, I’m wetting only the small area beneath an individual plant, just enough to soak its roots as they establish themselves in the surrounding soil. People find it hard to believe that that statuesque watering posture is really necessary. All you have to do is scratch the soil surface after a David-esque spraying of plants to see how deeply the water percolated, and you’d find only a thin layer of wet soil, at the surface. Digging a hole in the ground is a good way to tell if watering was sufficient. But it’s also inconvenient. For just a few dollars, I invested, years ago, in an electronic gizmo that bypasses all that hole digging. 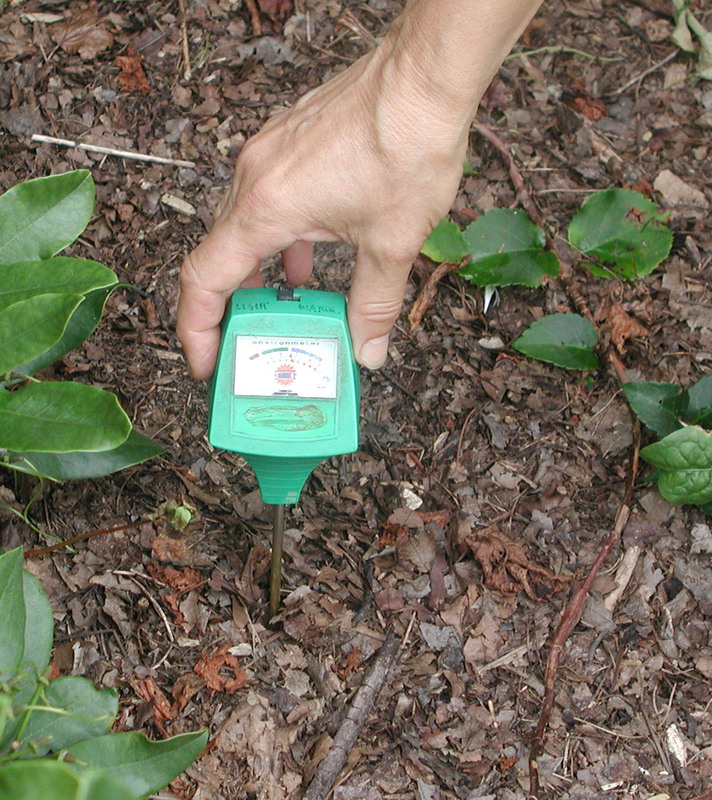 This soil moisture sensor has a metal probe that you plunge into the soil. Atop the probe is a dial or digital readout that tells whether the soil is “DRY,” “WET,” or something in between. More accurate sensors cost over a hundred dollars, but the cheap ones are fairly accurate and work well if coupled with observation. I’m still hand watering the pots because I haven’t yet connected the drip tubes that will direct water to each of the pots. This entry was posted in Flowers, Fruit, Gardening, Houseplants, Soil, Vegetables and tagged drip irrigation, soil moisture probe. Bookmark the permalink. Trackbacks are closed, but you can post a comment. are the black plastic irrigation tubes safe? I really don’t like plastic. Are there any alternatives besides bamboo? would food grade rubber hoses accept emitters? I also avoid plastic, when possible. 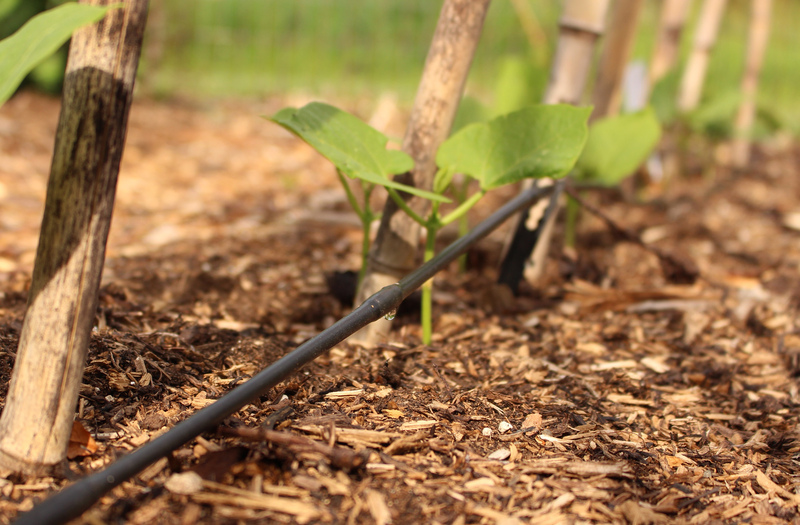 In the case of drip irrigation, I think the benefits outweigh the risks, if they exist. The longevity of the plastic probably indicates that it’s staying intact chemically. Even if a miniscule amount of something was leaching from it, that something would go into the soil, not on the leaves. I feel comfortable with the plastic although, not that you mention it, I would be interested if anyone has ever tested what, if anything, ends up in the water. I’m a professional in the nursery industry and your conversation on watering is all too familiar! Folks always think they water perfectly and it’s almost always the culprit, though they don’t want to hear it. Thanks for spreading the word that it’s not as obvious as most think it is! I read that you will be giving a class in drip irrigation. Very nice but I live in VA and am not likely to travel that far for a class. Here’s hoping that you will consider an on line class.. I will second that hope for an online class or a more in-depth post, or both. I *think* I have a good system but I’d love to learn more. I am guilty of never watering. Why oh why don’t I have a system set up in my veggie garden? You have now inspired me. We were very dry here for a span but now I am certain we have moisture even without that nifty little gizmo! I bought a rain gauge last year so I could monitor the veggie garden. Did I put it back out there this season?No. Do I know where it is? No. Am I even “monitoring?” No. Watering system it is! Tell them to lay out the open and empty tuna and pet food cans around their plants and then water. How much water is in the can? Not much I’d bet. Whatever the depth is the depth they are watering. An inch if they were patient enough to stand there until the cans overflowed.